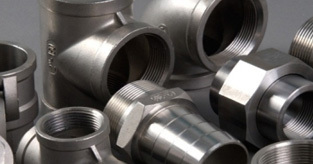 Our clients can avail form us a vast range of Titanium Forged Fittingsin various grades. Designed as per the industry standards, these are made using quality raw material. Our range finds applications in various industries and is offered at market leading rates to our clients. Titanium Gr 1, Gr 2, Gr 3, Gr 4, Gr 5. Welding Boss, Cap, Insert, Weldolet, Threadolet, Sockolet, Nippolet, Latrolet, Elbolet, Nippolet, etc.